Sorry but not suitable for children due to safety in the pool garden. Featured in the Sunday Times, Telegraph, OK Magazine and awarded Tripadvisor’s ‘Certificate Of Excellence’ in Speciality Lodging, Mijas area. These two romantic little cottages are the perfect getaway for couples wanting an idyllic summer holiday or some warm winter sunshine. Also ideal for friends and family wanting to holiday together but wanting their own space. 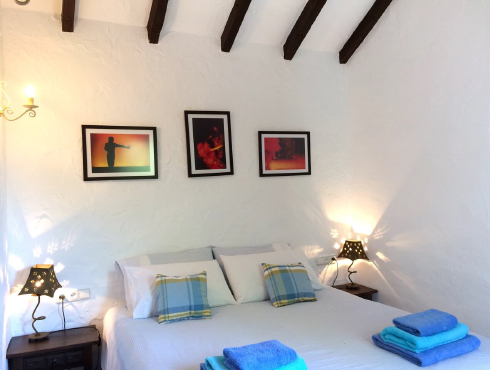 Casa Limones is close to the pool garden and has panoramic 180 degree Mediterranean and mountain sunset views ! 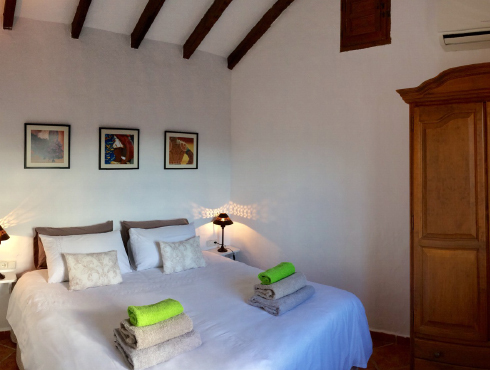 Los Olivos is set overlooking it’s own olive grove with spectacular uninterrupted views across heavily wooded hills to the dramatic mountains in the distance with stunning sunsets ! Casa Limones and Los Olives are privately situated 40 meters apart, tucked away in the hills near the white walled pueblo of Mijas, Andalusia, Southern Spain. Only 40 minutes from Malaga, centrally located for day-trips to the Alhambra at Granada, vibrant Seville and historical Ronda ….. all on empty scenic roads. While the surrounding countryside offers total tranquility, local tapas bars, restaurants, shops and beaches are just 10-15 minutes drive. The smart cosmopolitan restaurants of Marbella, Puerto Banus and Mijas are only a 25 – 35 minute journey by car – or just spend a peaceful evening on the patio dining “al fresco” whilst watching the sun sink slowly behind the mountains! Enjoy long lazy summer days beside the pool in the peaceful and beautiful Mediterranean garden with magnificent views to the mountains of the National Park.